In 2004, the Boston Red Sox won their first World Series title since 1918, 86 years earlier. Stacked with a roster that featured Pedro Martinez, Curt Schilling, Manny Ramirez, David Ortiz and Johnny Damon, Boston did the unthinkable, coming back from down 3-0 to the New York Yankees in the American League Championship Series. The Baltimore Orioles find themselves down 3-0 to the Kansas City Royals, and have not looked like a Championship team over those 3 games. Kansas City has not trailed in a game past the 6th inning. By now, we all know about Kelvin Herrera, Wade Davis and Greg Holland putting in work, and the Orioles bats have gone cold late in games. Herrera has pitched 4 innings, allowing 1 hit and 1 walk, striking out 5 O's. In Game 1, Herrera came in, in the 6th inning to get the Royals out of a jam. After Brandon Finnegan allowed a run to score, and left runners on 1st and 2nd with no outs, Herrera got Adam Jones to ground out into a fielders choice, followed by a Nelson Cruz double play. In the 7th, Herrera got Steve Pearce to fly out, and punched out J.J. Hardy and Ryan Flaherty, in order. Game 2, after his own error, failing to cover first, Herrera walked Alejando de Aza, and the Orioles were in business with two on and no outs. Herrera struck out Jones, allowed a single to Cruz, and with the bases loaded, got Pearce and Hardy to fly out, ending the inning. Game 3, Herrera pitched a 1,2,3 inning, getting Hardy to ground out and striking out Flaherty and Nick Hundley. Herrera has averaged 14.5 pitches per inning. Davis has pitched 4 innings, allowed a single hit and struck out 6 Orioles batters, while walking none. In Game 1, Davis got Hundley to pop out, K'd Jonathan Schoop and got Nick Markakis to fly out to right field. 3 up, 3 down. Davis stayed on in the 9th inning of a tie game on the road, and struck out the side (de Aza, Jones, Cruz). Davis earned the Win. Game 2, Davis started the 8th inning striking out Flaherty, before Caleb Joseph flied out to center, Schoop singled up the middle and Markakis grounded out to Mike Moustakas, ending the inning. Davis earns his 2nd W of the series. Game 3, Davis set the Orioles down in order in the top of the 8th, striking out Schoop, Markakis with a fly ball out and de Aza grounding out to Hosmer. Davis averaged just over 12 pitches per inning. Greg Holland has saved all 3 wins for the Royals, thanks to 6 ground ball outs. In Game 1, Holland started the bottom of the 10th inning with a Pearce pop out to Salvador Perez. He then struck out Hardy, and the Orioles were down to their final out. After a single by Flaherty, Holland walked Jimmy Paredes, moving Flaherty to second, who would then score on a Delmon Young single. Holland would force Markakis to ground out, ending the threat and sealing the W for the Royals on the road. Game 2, after Alcides Escobar and Lorenzo Cain gave the Royals a 2 run lead in the Top of the 9th, Holland got de Aza and Jones out with the ball not leaving the infield. Cruz would single before Pearce struck out to end the game. The Royals were headed back to Kauffman Stadium up 2-0 and 2 wins away from a trip to the World Series. Game 3, Holland came in to close the game with just a 2-1 lead, and set the Orioles down in order, a Jones pop out, a Cruz foul out and a Pearce ground out. It took just 6 pitches, but Holland has averaged more than 15.5 pitches thanks to a 23 pitch outing in Game 1. 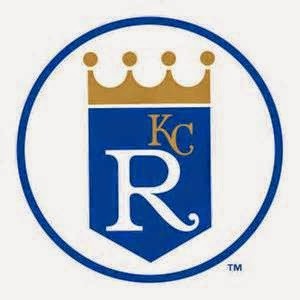 Game 4 is this afternoon at Kauffman Stadium, in Kansas City, Missouri. The game will be as entertaining as ever, the crowd will be insane and the celebration later on tonight will bring tears to the eyes of players and fans...some who have been waiting since 1985, and others who are experience the postseason for the first time. When you are making plays like this, the other team doesn't stand a chance!